Sorry for the sparse posts this weeks. When the weather starts to get cold, I start to lose motivation to do things like: working, blogging, getting out of bed in the morning. But there is one good thing for when the weather turns cooler - shabu shabu! 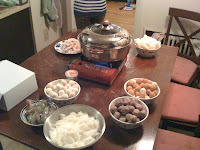 I was over at a friend's house for dinner on Monday and we had an awesome shabu shabu meal. Not familiar with shabu shabu? Brush up with a good 'ol wikipedia entry (here). It's like fondue but with a broth of some sort instead. A lot of folks have a little gas burner like the one in the picture I took from Monday, or there are also electric hot pots that you can purchase. It's a whole lot more fun (and a lot cheaper) to have shabu shabu at home with your friends. But if you're a first-timer, no sense in investing in all the equipment if there's a chance you might not like it. Instead, there's a number of shabu shabu restaurants in the area that you can try out. Here's the list of restaurants from the latest Stuff@Night (page 32). ShabuZen, Kaze, Shabu Shabu Toki, Shabu Quincy, Osaka Shabu, Shabu Village. The first two have locations in Chinatown, the rest of them I've never been to. 0 Response to "Cold Weather = Shabu Shabu Time"